Hello and happy Friday! I got some happy mail yesterday which included three Artful INKables sets! I just LOVE this silhouette from the Plant Prints set! I made this card for two challenges this week. The first is today's Limited Supplies Challenge to use any kind of bug on our card. The second is this week's CAS (clean and simple) challenge to use blue and green. I stamped this beautiful image with Not Quite Navy and cut it out with my long rectangle Nestabilities. I added the Kiwi Kiss scalloped frame. The base of the card is Not Quite Navy and I added the lattice texture using my Scor-Pal. I stamped the sentiment from Artful INKables Basic Sentiments with Not Quite Navy and punched it out with SU Oval Punches. The butterfly is a Martha Stewart Punch. I hope you like my very simple card and thank you so much for stopping by! Love it! Very clean, simple and beautiful. I'm thinking I need to add those rectangle nesties to my stash! CAS cards unnerve me because I’m a MORE IS MORE kinda girl – LOL But this is really nice – love that scoring you did too. Kerri, this is just terrific!!! Great colors and love the score detailing!!! Love the simplicity here...it really shows off the image and the lovely colors you used. A little really does go a long way. Absolutely gorgeous! 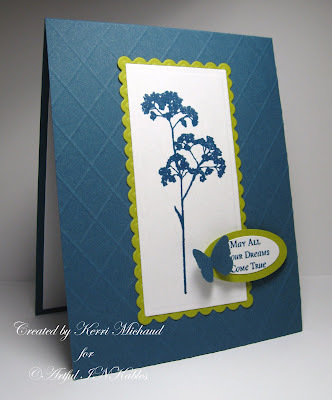 Love the embossed background and pretty colors!